Please refer to our stock # 1766 when inquiring. 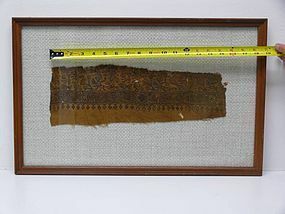 SOLD AS SET ONLY: Six Egyptian Coptic Textile Fragments, ca. 4th Century CE. All in excellent condition with varying measurements as seen in photos. Various sizes and conditions as seen in images. All i very good condition. Ex: Christie's South Kensington. Established by Saint Mark the Evangelist. The spread of Christianity encountered opposition in Egypt from Gnosticism and the cult of Serapis. It spread slowly to other parts of Egypt. The need arose to provide the converts with scriptures. This led to the emergence of Coptic, the Ancient Egyptian language written using Greek letters dating from the early 4th Century.